Sometimes I am so busy taking pictures it does not occur to me that I should stop and buy the damn thing. This photo was taken at the Brooklyn Flea. They have the best collection of nonsense you can ever find. I always get so caught up in the whole atmosphere of the place that I make the mistake of not making a purchase. 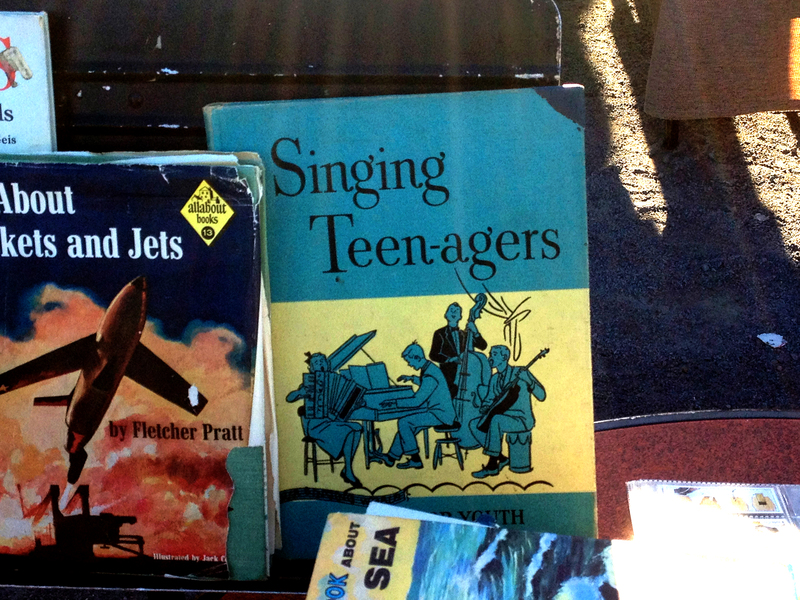 I particularly love the hyphen in Teen-agers. It was if the word had just started catching on. I am hoping this is still there next week. I was dying to see the inside of this book and of course was able to find it on ebay. It is a songbook from 1954! It can’t get any better, can it? The illustrations are to die for. I take great comfort in knowing I can buy it there if the Flea is out of it next week. If you’re interested in the book next to it (All About Rockets and Jets) my brother has a copy from when he was a teen-ager….no kidding!